Gale and then some... so we're going right? If you did not notice, a wicked low pressure moved in. Today we had winds above 50 and some gusts over 60. Patty went down to the beach after work. No boats appeared damaged. She also said the water was way flat. The real question is ... who's boat are we rigging? 50 KT winds, flat water, 50 F water temp, no rescue (except the coasties, who would be upset for us going out). WINDS TO 50 KT. MOSTLY SUNNY. 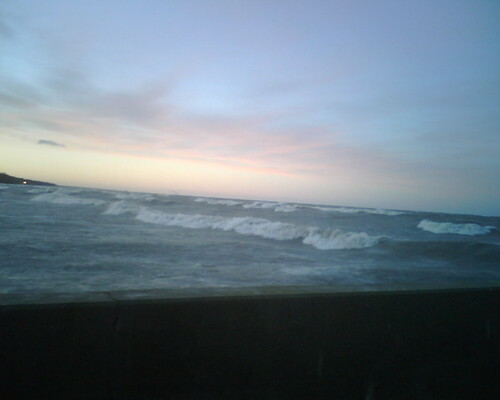 WAVES 5 TO 8 FT.
WEST TO 30 KT. MOSTLY CLOUDY. WAVES 4 TO 7 FT. SUNNY. WAVES 4 TO 6 FT.
Hobie 18 Day ... Sept 4, 2010. 20-25 from the NE. Okay it's been super nice and if you have not been down you should go. If you stored your mast with the park district they are on your boat. The water looks shallow a ways out so keep your dagger boards up for a while. Jeff skippered while I hung out on the wire back in September. Just a nice fun day. A gale blew in from the north and itsa doozy. Patty and I headed up to Tower Road and I snapped a couple of pics. We may talk a big game, but 45 kts dead out of the north may be a bit much. AC final BMW/Oracle Wins 2-0. Fast Multi-hulls cool again (as if going fast was ever not cool). TV coverage for the 33rd (all multi-hull) Americas Cup was non-existent in the US. Sailing Anarchy had good coverage and ESPN360.com had real-time video. Short answer... BMW/Oracle packed the Swiss team a lunch 2-zip, I think they even included some cookies. Good news for us, the little man... Multi-hull designs will take a huge step forward. Curved/lifting dagger boards will be standard on most spinnaker rigged cats in coming years as will air foils behind cross members to reduce windage. The new Nacra 20 already embraces these new ideas. If I only had 20K to burn. The extreme 40 design is now a mere stepping stone to the new Extreme 90 If I only had 5 million to burn. I'm stoked for this coming season. I received my letter from the beach asking for money, hope you did too. Contracts are due 2/26/2010. Well 2010 arrived and it is cold as crap outside. For those that think we should have all year sailing on the beach go stand outside for 4 hours and come back and post your thoughts. Rumor is Hedlund is moving to Evanston after Strictly Sail. I told them to email me if they have an inventory reduction sale, no word yet. Hopefully everyone got good stuff for sailing over the holidays. I have a fancy new pair of binoculars and a shorty, although I think the binoculars may be more for Patty keeping an eye on us. - Patty and I went down to the beach. Someone was out kite boarding. Looked like they were having fun. Cold, but fun. 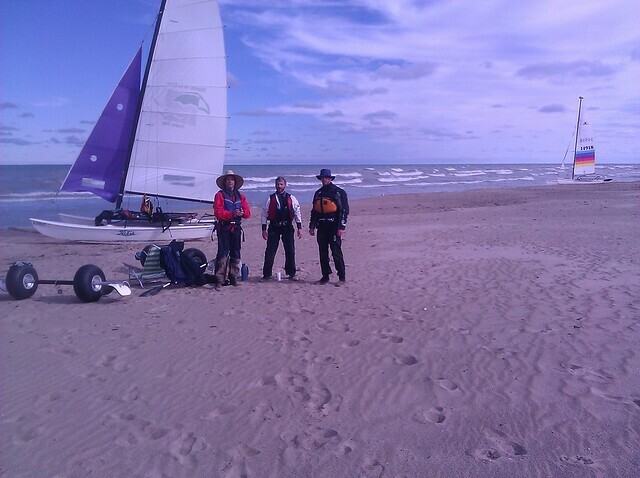 We are not from Wilmette beach but close Evanston - Northwestern Sailing. It was a blast – South-West wind about 12 Knots. 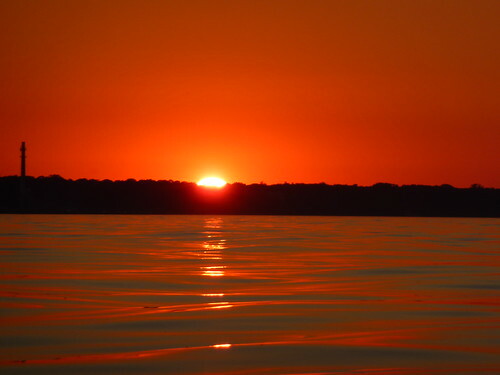 And the whole lake for as no other boat on the horizon. I convinced Ronni to go for a sail (really had to twist his arm). We hit about 18 kts. We must of been having fun, Joe was watching us from his condo and came down to the beach later to shoot the breeze. Might be the last sail of the season...we shall see what this weekend brings. 20 kt winds gusting into the thirties made for an interesting day. I have some good video of Roni and I trying to control the beast. Some of the most violent cat sailing video I have seen. No flips for those wanting only carnage. We also sailed John's H-16 down to Evanston NW. Cheaper winter storage. They also had better wildlife. Roni called me and suggested another movie night, but I think the chance of (heavy) rain is too high. Sunday looks good for sailing tho. 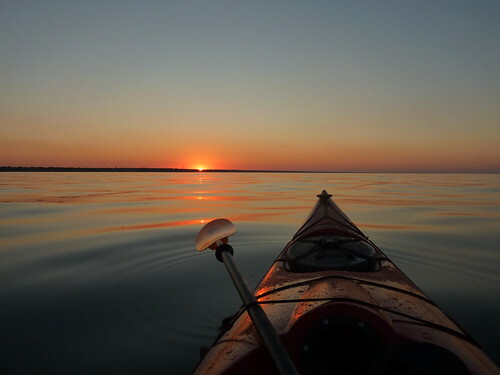 we will see you on the water. Joe... how's the kite cam rig coming? Friday Sept 18. Sorry I has to work, but word is ... it was awesome. One of the best days of the year. Will somebody comment? The day ended with "Movie Night" on the beach! Which was a big hit and a concept we will build on. Yes, you can run an LCD, an amp, and a DVD player on a 1200 watt generator. Saturday Sept 19. Steady 15 kt winds from the east made for an excellent sail. Roni and I chased Ed and Roy (or was Ed the one trying to keep up finally). We logged over 20 nm on the GPS, plus I left it turned off on a one sail. I finished the day with a sail with Doug. No reason to panic when he reaches over and sheets in for you so hard there is no way to un-cleat it. Travel out he says. We were screamin, double trapped. I think we were able get all the wind there was to be had. See Patty on the wire! Roy crewed on Monday after the fog lifted.